PLANS have been revealed to build a 210,000 sq ft, £45million landmark office building on the site of The Guardian newspaper's headquarters. The multi award-winning international architect and design practice, HKR Architects, has unveiled its plans for an ultra-sustainable block - The Wave - in Farringdon Road, EC1. Taking its name from the shape of the building, The Wave will employ cutting edge technology to minimise energy use and generate on-site power through tri-generation, which contributes to the 21.6 per cent renewable energy for the nine-storey building. The new design aims to re-establish the location as a landmark in Clerkenwell. The Wave will have an entrance on the corner of Farringdon Road and Ray Street, with ground floor shops and panoramic views of the London skyline from upper levels. The site is within the Clerkenwell Green Conservation Area. Guardian newspapers occupy the building, with approximately 1,000 people working inside. 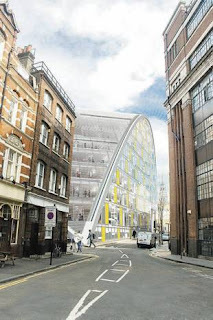 The building is due to be vacated in early 2009 when the newspaper moves to new offices in York Way, King's Cross. John Maxwell, director of developers Farringdon Property, said: "This is an exciting time for the area. The Wave will act as a first class example of best practice in new office design - right in the heart Farringdon, a uniquely creative and historic part of the City." Brian Woodward, lead architect of HKR Architects, said: "The modern and sustainable building will be aimed at the new office market and those who demand more in terms of location, energy efficiency, green credentials and flexibility. "We believe The Wave will raise the bar when it comes to sustainable commercial office buildings.